pop | I'm not stalking you. In trying to do some research while working on my next book, I ran across the coolest website ever! 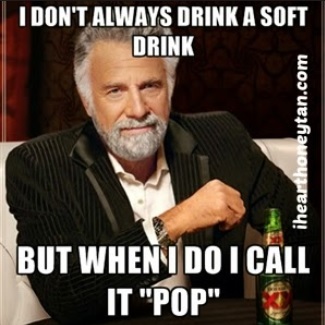 It is a website devoted to surveying people to find out what you call soft drinks where you live. And it shows that where I live, “POP” wins! Ha! You can take the survey (based on your hometown) and add your input to the color graphic as well. I especially encourage you if you are from one of the counties currently in white, meaning their is no data available. Posted in A day in the life, What I Learned This Week and tagged coke, cola, knowledge, pop, soda, soft drink, survey. Bookmark the permalink. Remember my post about the Luke Bryan song “Play It Again” a few weeks ago? Well, here is the mix CD that song inspired, along with my commentary and select YouTube clips where appropriate. This is a country song from 1993. It is a song that I have tried hard over the years to remember the title and artist. According to Wikipedia, it never charted. Which is why it is hard to remember much about it. But that summer, I watched a lot of music videos on TNT and CMT. This video was in heavy rotation, and featured a very brief cameo by Davey Allison. I was impressed by this because I had just begun to watch NASCAR races (Shout out to Jeff Gordon!). Also, Davey Allison would die that same summer in a helicopter crash. Love this song. Good beat, good lyrics, great to crank up to the max in the car and drive. I am a little over this song now, but included it on this collection anyway. I was impressed with how original the sound was when I first heard it on the radio on our vacation to Gettysburg in August. I feel like it is the kind of song my best friend in high school and I would have run out and bought the cassette single of. I got so excited when I heard this song on the radio. I was like, “Oh, one of my favorite American Idol alums Blake Lewis finally has a hit song that all the stations are playing.” Then I discovered it was actually Ed Sheeran who sings it. If some white boy was going to sing this song, it should have been Blake. He was robbed. I like this. Very me in 6th grade. This girl has a life I could never imagine living. I like Joe Nichols because I always think that he sounds like George Strait, although not so much in this song. This song is very similar to “Play It Again.” Hence, why I did not put them right next to each other. And the girl’s voice annoys me because it reminds me of the girl who plays Scarlett on ABC’s Nashville. If these are truly the reasons why God made girls, then I am a complete failure as a girl. But it has a good beat and sounds like classic country, so I included it. This would be the antithesis of the previous song. And the next song. Which is why I LOVE that these three songs appear together in this order on this CD. Any song that references classic hit-makers like Conway Twitty and George Strait is number one in my book. And they totally have a point about the bikini tops and Daisy Duke shorts. And they manage to spin it into a very catchy song. Cruise was released to pop radio as a mix with rapper Nelly, and was a huge hit. A few years ago. Yes, I am behind. This song is exactly the type of song that Maddie & Tae were just rallying against. The girl is in her bikini top, riding along silently in the man’s pickup truck, traveling down a dirt road she doesn’t even want to be on. I love these songs as much as the next person (I did include it on this CD, afterall), but does EVERY country song have to sound like this? Posted in Entertainment Worship & Review and tagged Blake Lewis, CD, collection, country, Cruise, Florida Georgia Line, George Strait, Girl in a Country Song, God Made Girls, Joe Nichols, Lisa Stewart, Luke Bryan, Maddie & Tae, mix, Play It Again, pop, RaeLynn, song, tape, Under The Light of The Texaco. Bookmark the permalink.